I saw these cookies on the last page of the September issue of Food and Wine. Kurt loves chocolate chip cookies, so I immediately decided I should make these for him. Yes, these were all for Kurt. 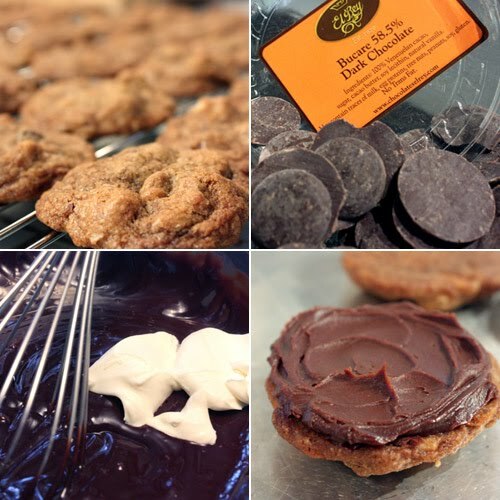 At any time, when asked what kind of cookie he would like, the answer is always chocolate chip. I hoped he wouldn’t mind the usual simplicity being ruined by a chocolate ganache filling, but I thought he would probably be able to deal with it. So, yes, these cute, little, crunchy cookies with a rich chocolate ganache sandwiched between them were not something I would want. Not at all. This baking endeavor was entirely for Kurt. The cookie dough recipe is straightforward. 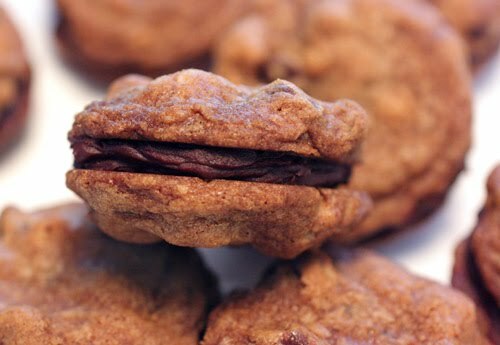 Walnuts were added to the dough, and if you prefer your chocolate chip cookies without nuts you could omit them. The walnuts were particularly enjoyable in this cookie though. I mean it seems like they would be since these cookies were for Kurt not me. The ganache filling was started in the usual way. Cream was warmed with corn syrup, and that was poured over chocolate. The chocolate was whisked to a smooth state, and then the recipe called for creme fraiche to be added. I had never added creme fraiche to a ganache before. Butter, yes, but not creme fraiche. The finished ganache was chilled for 30 minutes before being spread on half the cookies. I noticed that my cookies turned a little darker than those pictured in the magazine. Next time, I’ll check on them before the end of the 12 minute baking time. So, after baking the cookies, making the ganache, and filling the sandwiches, I gave up the notion that these were just for Kurt. I had tasted a plain cookie and quite liked it, but the sandwiched cookies with this chocolate filling were just crazy. I want to say the creme fraiche made the ganache a little more like chocolate pudding, but I really didn’t think about it for long. I was too busy trying to prevent myself from devouring every last cookie before Kurt even got home. OMG, this is extra special choco chip cookies!! You just made CCC better! my husband is a choco chip cooking man--he would love these. Yeah, this is just ridiculous. I totally could not trust myself around these cookies if I made them. These look gorgeous! I adore that first photo, makes it so appealing. And I must try these as my best friend is a big fan of chocolate chip cookies. What delicious treats!! You can't go wrong with a good old-fashioned chocolate chip cookie. These are over the top with the ganache! I had a chocolate chocolate chip ice cream the other night that he might like! I am all for these cookies, must be a good guy that Kurt! I looove ganache! These cookies look heavenly! Sounds like something that really needs to be tried! Running off to the kitchen now..heh heh. mmm delicious!! not at all over the top indulgence...just the right amount I'd say!! Looking at these from Paris today, and they look just like the French macarons! These lovelies caught my attention in F&W too -- they look so good. Great idea on the walnuts. I have made ganache with creme fraiche before and really enjoy the flavor. I just may have to try these! with all the macaron feet trotting around, i almost thought these were macarons:-) what a new look to the choc. cookies.! I know that my kids and I would gobble these right up but my husband doesn't like chocolate. Isn't this the craziest thing ever?! whew! Talk about intense chocolate! I'm not a huge chocolate-lover, but I'll bet if I carried those around in my purse, I'll be making tons of new friends! lol! I also saw those in Food and Wine, and thought about baking a batch and bringing to work. OMG! These look divine!A good cup of coffee and about a dozen of these cookies and I would be a happy person. YUM! Aww these looks so good! Nice creation! 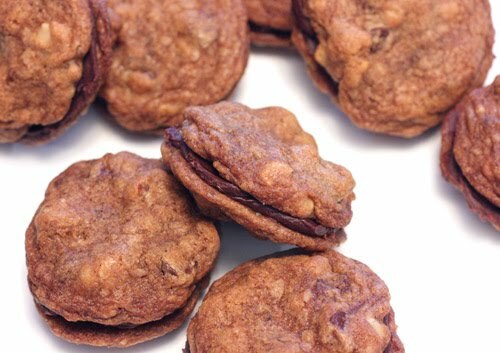 These cookies sound heavenly with the ganache filling! Mmm, I love ganache! These cookies look great. You just proved what I always say and believe in. There can never be too much chocolate! Gorgeous.